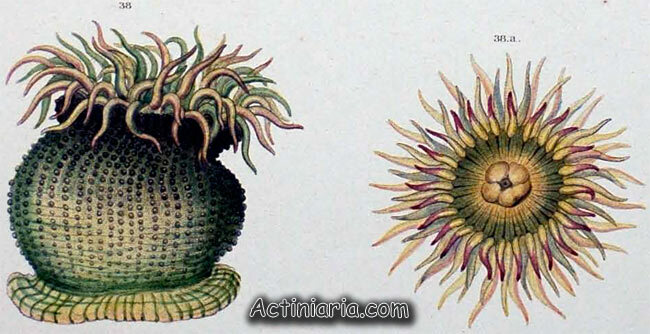 Below is original colour figure of Anthopleura artemisia as it was published by Dana more than 160 years ago, in 1849, in his Atlas of Zoophytes. Note the colour of the tentacles, the figure shows tentacles of various colour, greenish and yellowish, with rose tips, note also colour of the oral disk, greenish with yellow, and dark lines running to the bases of the tentacles. 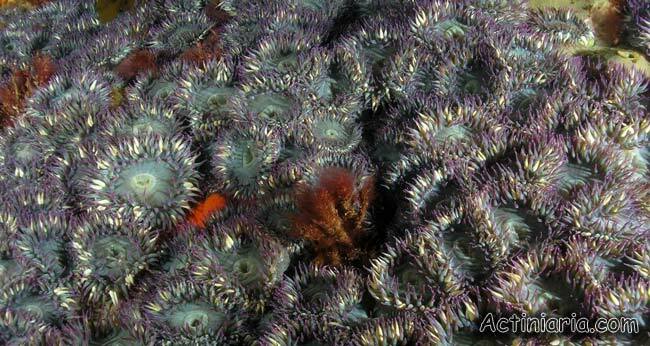 And now compare this picture with the photos of Anthopleura elegantissima above. Very similar, is not it? For us it is absolutely clear that Dana’s original figure of Anthopleura artemisia shows a species which is currently known as Anthopleura elegantissima or Anthopleura sola. 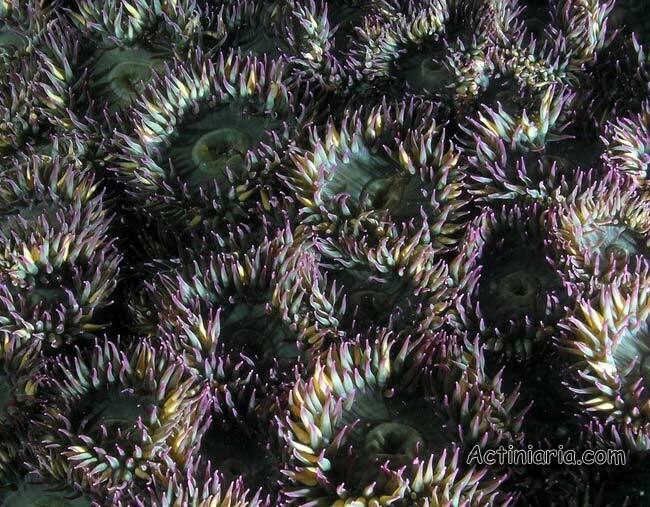 Technically this means that the name Anthopleura artemisia might become a valid name for Californian anemone known now as Anthopleura elegantissima (because the name A. elegantissima is certainly misapplied to it, see text above). However, internet website is not a valid place to made any taxonomic actions, so our goal here is just to point to existing problem, not to undertake any actions to solve anything. Antopleura elegantissima, also known as aggregating anemone, forms large settlements of many closely aggregated specimens. Hand (1955) wrote: "It most commonly occurs in extensive beds of individuals, sometimes covering more than 60 square feet, the number of individuals in so large bed approaching 100000". Originally the species Antopleura elegantissima was described from Alaska by Brand in 1835. The description given by Brand is short and not allows certain identification of his species, but it contains some notes on colour of living specimen and it differ considerably from the species from southern locations (California and adjacent regions) currently known under the name Antopleura elegantissima. This fact was recognized by many anemone taxonomists, including Hand, 1955, Cutress, 1949, Pearse and Francis, 2000. The latter authors suggested that "Despite some doubt that the name A. elegantissima is properly applied to the most common small intertidal anemone of California, this name is so well established in the literature that it should be conserved for the clonal species". However, no actions were undertaken to solve incorrectness of the usage of the name Antopleura elegantissima for Californian species. So, although this name is widely used for Californian species this usage is incorrect.